Aquila can be found on Oculus Home and a SteamVR version is on Steam. Having one, then contacting me with proof of ownership will get you the other. For Oculus owners with Touch I'd recommend the Oculus version. Please see the post at the end of the thread for latest changes. Oculus Home version is currently 0.97, while Steam is one behind at the moment on 0.96. I need more hours in the day! 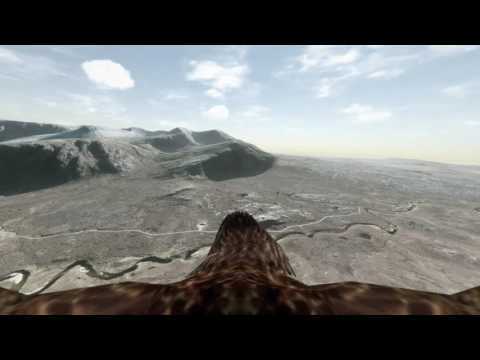 I have been writing a soaring bird flight simulator for the Oculus Rift, where you embody one of three species of eagle in three different terrains. You have full control of the bird in all axis using either Oculus Touch, headset steering, or an Xbox360/One controller. For headset steering, no controller is required, you just need the Oculus Remote, keyboard or gamepad to select menu options. More details in the demo release notes. 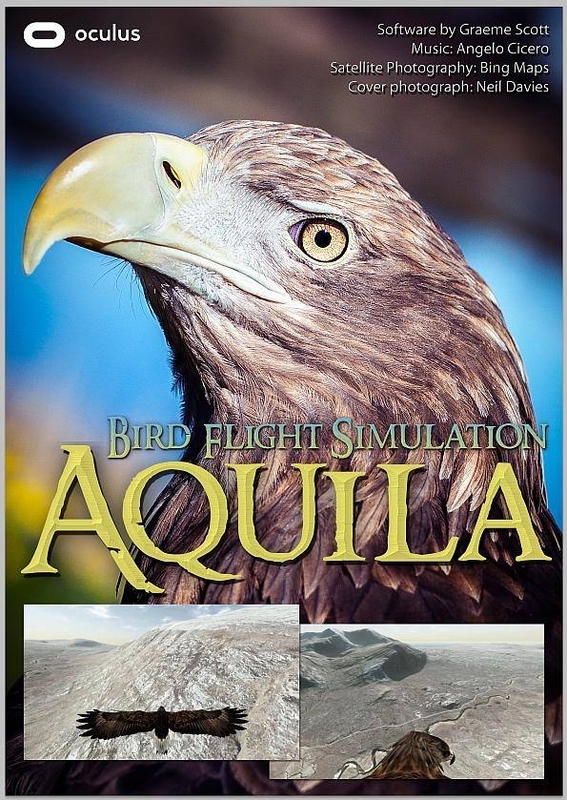 Please note the downloadable demo has the Scotland terrain only, a 10 minute flight time limit, but all three birds. This is a pretty intense VR app in development. It has been demonstrated at three events last summer, including at RIAT 2016, and 4 felt nauseous out of nearly 200. If you think you may be affected, keep the flying gentle and cruise the ridges, and keep your sessions short to start with. I'm working on ways to make it more gentle. The touch support is challenging; gliding is simple enough, but flapping flight is pretty exhausting after a few minutes. The game looks at the area you cover and frequency while flapping your arms in a circular motion to define your flapping power, while you're still steering with your hands. The videos below are running on a Windows 10 system with an i7 6700K processor, 16gb ram and a GF980 GTX. I believe any VR ready system should run it, but that's why I'm posting here. - Dude you're a freakin' eagle! There are three species, the white tailed sea eagle, the bald eagle and the harpy eagle. 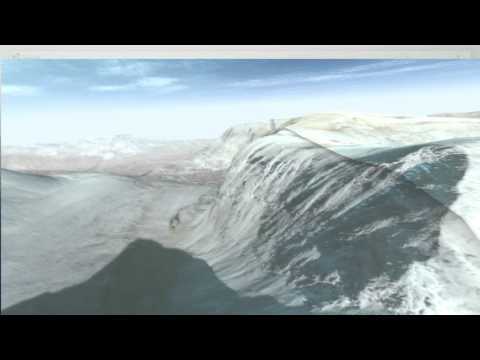 - You have thermals and ridge lift to make flying easier. Thermic lift is marked with coloured markers (red for down, yellow for neutral and green for up). Wind direction and speed can be set on the main menu. - The white tailed eagle model has been rewired to be animated by code script in C 'hash'. The wing flapping is controlled by sine curves (and for Oculus Touch, your arm positions), while the control surfaces move by reading the Xbox controller axis, or the equivalent from your chosen control method. 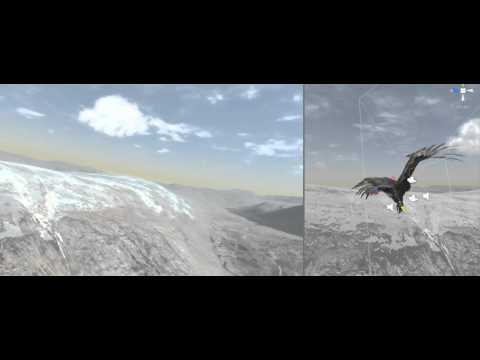 The other two eagles are animated using normal Unity animations. - Free looking in VR, and movements are reflected in your shadow. At the moment, if you look behind you it will let you look through yourself and it's not pretty! - Fairly accurate flight dynamics, but I wanted it to feel right for anyone. The aircraft toolkit is configured to be an equivalent aircraft size and mass with the correct wing area. All I'll say is keep your speed up, as stalls create a large wing drop. - You can land and take off, and walk around on the ground. No you can't land in trees (yet). - Very high detail 13km x 13km for Northwest Scotland (plus an extra 13km lower detail each side for extra horizon). There are two additional terrains in Columbia and British Columbia, of equivalent size. The additional terrains are not in this demo for size constraints. - Day/Night cycle using UniStorm. Very pretty!! - Wind particles that show you where the wind is coming from. - Two demo courses on the Scotland terrain, simply there to show a good way to soar the main ridge, and give a start and finish goal challenge. They're not to be taken seriously. - Observer mode is now selectable from the in-flight menu, and displays on your main pc screen while you're in VR. It does, of course, have a performance hit when enabled. - Unity personal edition 5.5.0b11, with Oculus SDK 1.10. 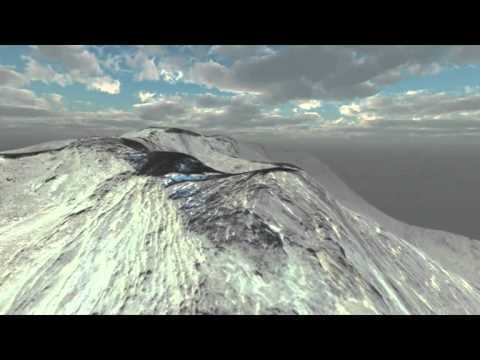 - World Composer, and Terrain Composer. - Aircraft Flight Physics Toolkit. Awesome piece of kit. - UniStorm for the day/night cycle. - the eagle model is under Birds_Eagle_Anim on the asset store. 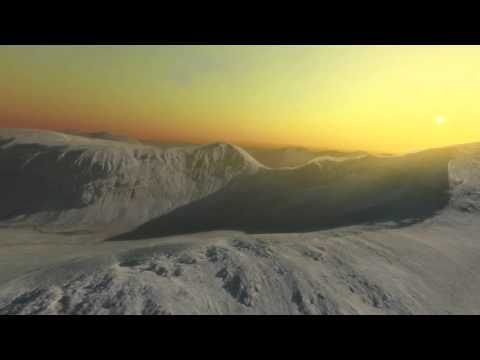 - 3D Animated Clouds by MPixels. Very tweakable. - Currently ugly if you look behind you, if you don't move your own head up, as you'll look through yourself! - (GRRRR) If you fly too fast, you pitch down. It's controllable, and rare now thankfully, but it will do it. - If you get too slow on a loop, you waste lots of height recovering. That's possibly not a bug. - You can't currently 'trim' in pitch, although you can fly just fine without. - The flapping doesn't look quite right for the white tailed sea eagle, but it's a sine curve what am I supposed to do? - The white tailed sea eagle does not have a ground walking animation. Please see the release notes for the demo. - UniStorm sometimes goes overboard with the contrast after the latest Unity update. - Oculus Touch... if you bring both wings in to stoop, you may need to pitch down to keep your dive going. - Oculus Touch... if the wing controls don't seem to be working, check that your headset and Touch controllers are within your sensor range, then press X on the left-hand touch controller to reset the headset orientation and the arm positions. It should then recalculate everything from where you are. - (PARTWAY THERE) More dynamic landscape with things to do of course (challenges). - (DONE) Thermals and ridge lift. - (PARTWAY THERE) Maybe one large landscape, or many smaller ones. I'd love to be able to add more trees! - (Plan in motion!) Perhaps multiplayer, or motion platform support a la Birdly. - Survival simulation? Weather etc. Comments and suggestions welcomed. Thank you again! Please see the videos below. 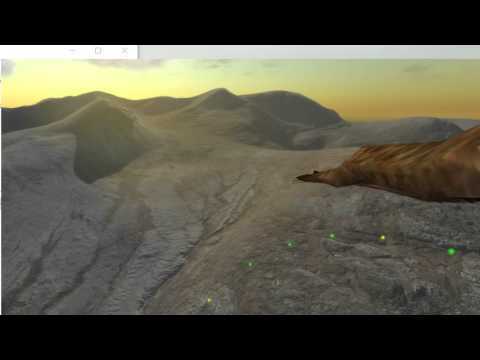 Another video showing how the headset position is mapped on to the eagle model. 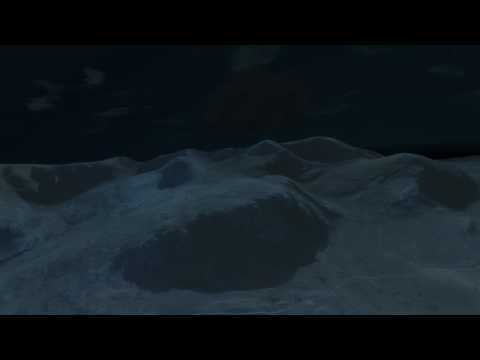 This video is captured from the Unity editor. Thank you for looking ..
Latest video for my bird flight simulator. This time I've used another corner of Scotland, to see how high resolution I can get. If anyone knows a way of removing the lines in the terrain, please let me know. I think it's a lighting issue in either Unity, World Composer or Terrain Composer. - Using UniStorm for the lighting and day/night cycle. What an awesome Unity add-on. - thermals are more like real ones. You have sink on the outside, lift in the middle, and a puffy white cloud. When in a thermal, you leave temporary coloured markers behind you that are red/yellow/green depending on whether you're in lift or not. - the weird tracks in the terrain are gone finally. Problems: When it gets dark, the scenery still has sun shadows on it. The clouds won't go dark, they stay white grrrrr.... My thermalling ability is crap, and I'm an (admittedly rusty) glider pilot, so I do a pretty naff job of soaring. Anyway here's the video, and thank you for looking. the landscape is one of europe' s last wilderness! Really glad you like it. In time I'd love to make a demo available online, but at the moment I don't even know how to do that! Is it even possible with unity personal edition? I suspect, with my learning on the go, the required spec maybe quite high though. Can't do a video from one end of the day without doing the other? Here is a video of a sunrise, but also the horizon is correct now and the lighting seems to work better. The clouds in the sky are now white and not black. The white thermal clouds stay white as I've found that Unity will not ambient-light particles. Great. Anyway still plenty to keep me busy! Hey, this looks great! How long is your day night cycle? if you know exactly, you could fix your problem with the white clouds by animating the colour and/or opacity over time to react in just the way you would like. I am guessing they are not a part of a day night cycle package you are using. Another thing that would look cool is if you took a few of the feathers on the birds wings and used the cloth simulation to have them flapping in the breeze. Thank you for the reply. You're right I made the clouds as Unistorm doesn't do thermals. 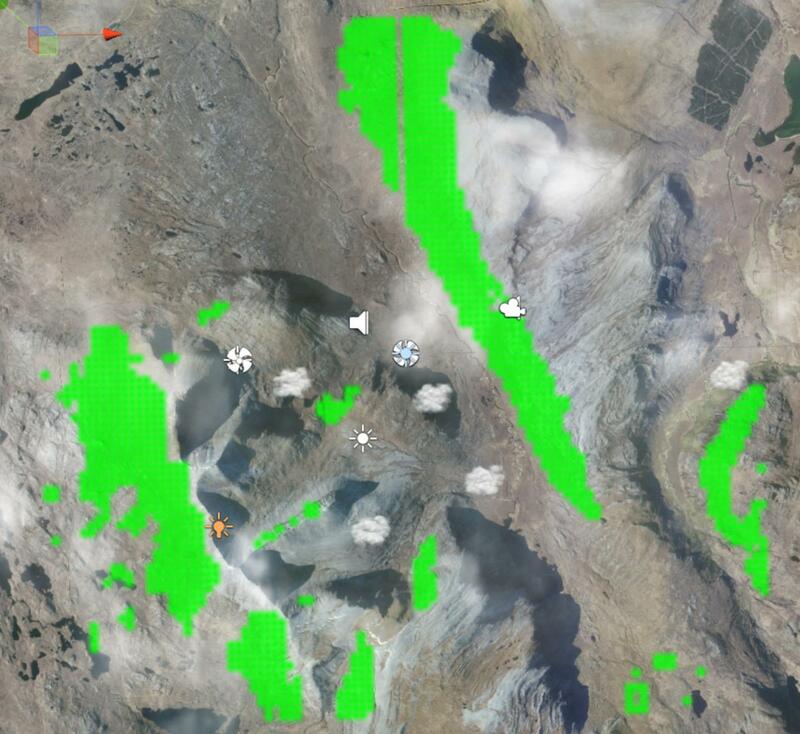 Mine develop, the cloud and thermal forms (using a WindZone), then the thermal dies and the cloud fades away. Your post made me think that I could read the Unistorm light dynamic clouds colour, which changes over the day, and apply it to my cloud. After much faffing with syntax it works. Thank you very much. I just flew through a whole game day to see the changes, and now I'm very tired. I think the whole game day only took about 45 minutes or so. You can change Unistorm to whatever you like. Love the idea about animating the feathers. Unfortunately I think it's part of the texture so I can't animate individual feathers. I'm not an artist at all I wouldn't know where to start editing the 3ds file. Hey Great news, glad that worked:) 45 mins woah thats a lot of play time, maybe you should change the cycle to 5 to 10 mins so people will really notice it. Just an idea. Let me know if you want a hand with the feathers on the bird I can do that. Send me a PM if you want me to get that working for you. Yeah I'd be interested in seeing what you could do with it. I guess more joints would be needed, so I could animate those in script too. At the moment I animate the tail and wings with script, both the flapping and a bit of casual movement with the wings and tail so they're not static. I plan to move the toes, legs and beak too. If I use the 3ds animations, it overrides my code and doesn't work for me. If I could script it, then I could link the feathers movement to airspeed. Remember I first ran Unity in September, prior to that the last coding I did was 2005 with c++. I did the rollerball and space shooter tutorials, had a brainwave and jumped straight in! There is loads more for me to learn. Looking good! I love flight games! If you need some beta tester, please contact me. I tested a lot of vr games, also i have a small youtube channel, in spanish. Keep the good work! Ridge lift is on the way! The wind direction is configurable and calculated on first run. 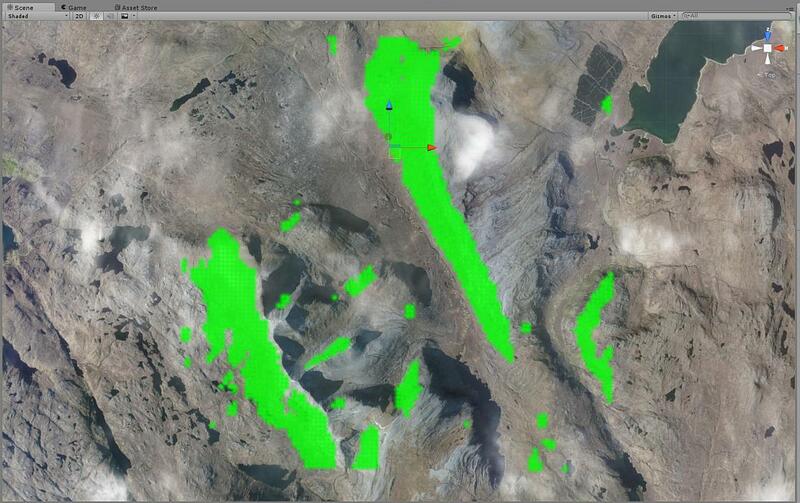 I've attached a screenshot of the areas of lift the sim has marked after looking at the terrain with a west wind. Sink is also dealt with, but not marked on the screenshot. You don't see the markers in-game of course. I'll follow-up with a video later. Thank you for the offer! If I get it to any decent stage I'd release something, but at the moment I can't make a standalone work properly without giving away the whole project. - So yes Ridge lift - It's not finished yet, but it works ok so far. Basically it looks at a given wind direction at start, then an algorithm looks at the terrain and works out where lift and sink it according to the slope. It doesn't allow for wind shadows or any rotor effect, so for off-wind slopes it'll just pull you down at the moment. - Clouds now drift with the wind, and have between a 7 and 15 minute period between formation and decay. At the moment, when they decay they move themselves and start over. - The program deals with putting the general wind, any thermic wind and ridge wind, then puts it all together for the flight model to deal with. I kept everything as Vectors so I could combine them together. Sorry I missed the sunset, but thanks for looking! 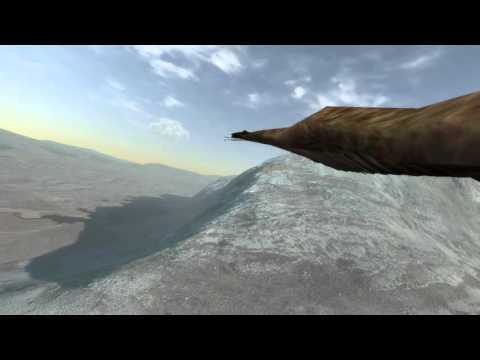 Here is the latest development video for my bird flight simulator. It's been a while since the last one, but I've been busy trying to learn more about how Unity ticks. - The intention is to have more than one bird species. 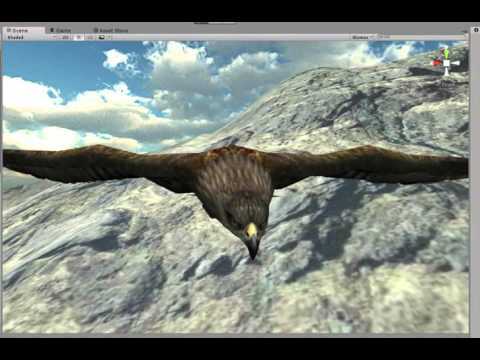 As such I've added a golden eagle model with a complete set of animations and implemented a few, such as the idle animation, walking, flying and gliding. I have masked the head animation so that I can still move the head with the headset position and rotation. The intention is to do the same with the tail when gliding/flying, and the wings and tail when gliding. I had extreme heartache trying to get the head angle to behave itself consistently. - transitions between flying and landed animations. It detects when you're on the ground with no speed, then deactivates the flight model and activates Unity's FirstPersonController. You start flying and it does the reverse. When on the ground you can walk using the controller. I uploaded the video from the Unity editor so you can see the view from the headset, along with an external view so you can see what's going on with the animations and the head position mapping to the Rift. That's it for now. I have a bug list longer than an eagles wings to deal with, but not tonight. No video this time. To be honest you wouldn't see much difference unless you were to play the sim yourself. I'm going to update the top post, as it's rather out of date! Well the changes are all to do with wind. Up until now the ridge lift calculated had nothing to do with your height above the ridge. This is now a little more realistic ... you get the best lift until about 1/2 again the height of the ground beneath you, then it tapers away to nothing when you're twice the height (and higher) of the ground underneath. The code that examines the slopes to calculate potential ridge lift now accounts for the direction of the slope. I had been finding lift where I would expect none. This now uses trig to work out the relative direction of the slope to the wind direction. If the wind meets the slope head-on, you get the full whack ... it uses cosine to work that down to 1/2 the lift when you're 60 degrees off, then no lift at all if it's completely across at 90 degrees. I've added a comparison shot of the marked lift on the new method. It doesn't look that different at first glance, but what you can't see is that even the lift marked is of more sensible strength for the angle of slope. It feels more authentic to fly now. - I've begun to consolidate 'instruments' into their own gameobject. So far there's only a raycast to measure distance to ground, then altitude and whether you're flying or not. I want them to be more accessible than those in the aircraft physics toolkit. - Some background work towards being able to choose your bird, but keeping the same script in the background. Wow it's been ages since I last posted an update on this, but that's not to say I've not been working on it. I've been trying to get my head around Unity networking. It's very clever and can do loads, but I've managed to get it to do what I was after. Basically I wanted the ability to 'view' the flight from another pc and record the video for a corporate event coming up. So this video is from a laptop connected to the game over a wireless network. Both pc's are running the game, one as server and one as client. The client laptop is watching the game, and recording the video linked below. Using another pc keeps the game running smooth on the main pc running the Rift, and will allow me to copy the videos promptly on to usb drive, etc, without disturbing the main pc. The biggest heartache was mirroring the bird actions on the mirror client. That will give me nightmares for ages. Unity stutters every now and then over the network. The game continues to run at 60fps on the laptop, but the network traffic seems to stall a couple of times (albeit in 16 minutes of play time!). 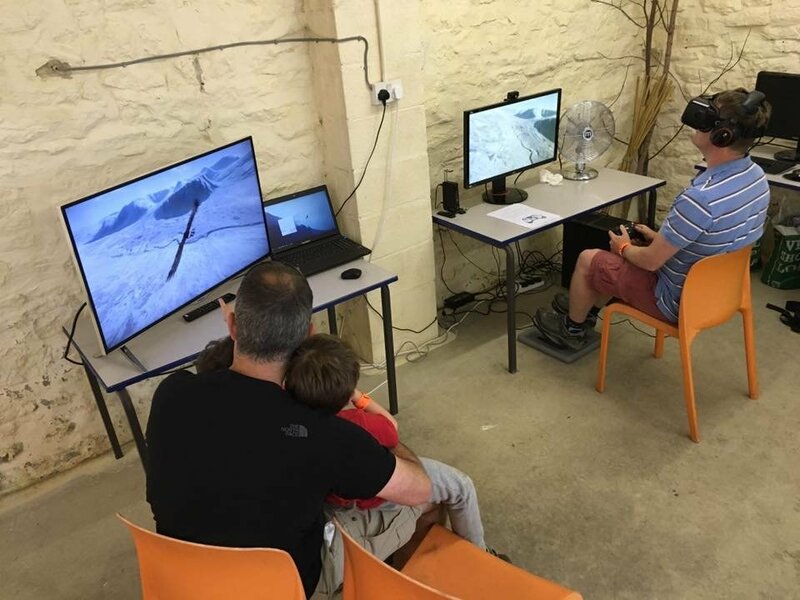 Basically people attending the event will be able to try the simulator on the Oculus Rift in exchange for a small donation going to a bird of prey charity, and receive a video of their flight as a thank you. Well that was a fun and interesting day! Bug swatting until 0515 this morning, then encounter a stack more bugs prior to the event starting! Probably the most stressful few days for ages. Anyway got loads done. The observer mode has more views, and cycles them, there is a wing flapping sound, the floating 'observer' has been removed, and numerous other bugs that were breaking the networking in Unity. It's been a nightmare. Right! A quick update to let you know that this is still ongoing. The Wings event on the 29th was the first, then it went on to a falconry fair near York last weekend, after even more bug swatting. It was well received, although I made a couple of people ill out of only about 20 who tried it. I honestly expected a few more, but falconers' are an odd lot! The good news is that it's going to the FutureZone at RAF Fairford for the Royal International Air Tatoo. A little ironic since my pc is 4 years old. Anyway it's going for definitely the Sunday and hopefully the Saturday. Anyone reading this who is there, please come and say hello and give it a go! Below is one of the flights from the show last weekend on YouTube. Here is a poster used for the event. It was chucked together in photoshop on the hop! Eagle eyed spotters may notice that the eagle photographed isn't an Aquila species, but for Jo Bloggs on the street I'm sure they won't notice. Anyway there's a golden eagle in the sim, and that is an Aquila. 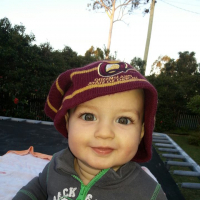 The photo was sent by a friend, and it's awesome, so it'll do just nicely! Below that is a photo from the event in York... a true nightmare of wires! I had the sim running on one pc, then a laptop pushing the observer mode out to a 4k tv. It looked lovely..... if only the Rift had that kind of definition!! Maybe CV2? A quick update to say this project is still active and in development. Fairford RIAT was a very interesting experience. I had a queue before I'd even connected the pc. Initially they didn't know what they were queuing for, which I found rather curious!! Over about 6 hours I had around 140 people try it, with some great feedback both as a game and a potential tool for school and special needs groups. It was well worth the exhausting time I had putting it together. Anyway I put a longer video together with a bit of a tour. Occasionally the movement goes choppy over the wireless network, but it sorts itself out. Oh and it gets dark. I'd like it darker! I had put a demo together, but on a standalone copy the sky is broken. If I can resolve that, I'll release a demo. I guess a file is missing somewhere. One thing is for sure, I'm going to be busy with plenty more to do. I've only just uploaded it, so it may still be processing. Wow this is really awesome looking! Nice work!!! Very intrigued by this - just found it - very anxious to try it out. Ok I have no idea if it'll work, but I've uploaded a demo to Mediafire. The interface isn't finished, but I'm curious how and if it'll run standalone. It seems to be Unistorm that screws up, if anything. That's the system that does the sky. - I've used Oculus 1.7.0, so even with a DK2 I guess you'll need that now. - It's setup to use an Xbox360 wired controller. Left analogue stick does pitch and roll. Right analogue stick does flapping with Up, and rudder with left/right. If you need to reconfigure the axes, check the input options. In the list, Horizontal_RH and Vertical_RH are the named axes for flapping and rudder. Redefine as you wish. - I can run with graphics set to fantastic, but try whatever you feel is right. My system specs are at the top. - Run the game. The current Oculus software makes the game stick on the Unity splash screen until you've looked at the warning acknowledgement in the headset. - It should go to the game start screen. Press A to start, well A on the Xbox controller. - I'll keep the next bit really simple. Sit comfortably, pick your headset centre position, press blue X to centre the view. You are sat on the ground. - In fairly prompt succession, press yellow Y to jump then green A to fly. That's just how it is. Wait and let yourself glide forwards over the ridge. The wind direction is from straight in front of you, so slopes facing that way generate lift. - Enjoy the view, then when you're ready try steering along the ridge gaining height. Flapping makes you pitch as you gain speed, so try it when you're happy controlling the bird. If you fly fast, you pitch down. It's a bug, just do something about it. - Thermals are the puffy clouds that generate after a couple of minutes, fly circles under them to climb. The best lift is towards the middle, and you'll find sink towards the edge. There's no way to 'trim', so you'll find yourself holding the pitch back to fly as slow as possible to climb best. Try it... it can be challenging but works! You'll see coloured markers in a trail behind you to see how you're doing. If you have a thermal over a ridge facing away from the wind, at lower altitudes the ridge sink will win. Well away from the ground you'll climb. Thermals have a finite life of about 10 minutes, but this is a 7 minute demo so don't worry about it. - The sky day/night cycle is sped up to encourage more bugs to show. You'll go through most of a day and part of a night in 7 minutes! - You have seven minutes before you'll be dumped back to the title screen. You can restart of course! - If you feel sick, remove your headset and press keyboard X to quit. Be gentle to start, flying games on the Oculus can be strong on the senses. - You can use the Observer mode used in the videos above. However you need to run the game on a second pc without the Oculus connected, and press O from the title screen to enable observer mode. You'll get a panning mode around the landscape. When you start the game on your Oculus system, if on the same home network, it should automatically connect on the observer pc. - Alt-f4 closes the game application. This is unfinished software. It is nowhere near what I want it to be. I'm more curious about whether it works on your pc, and what spec that is. I suspect any vr ready pc will be ok. I find it a very relaxing experience to use. I hope you do too! No frames dropped on "Fantastic setting"
That's quite a big of an OC for a 970. Just tried it and sorry but I instantly felt dizzy & bit sick - looks like it will be fantastic for those lucky people who can endure such extreme motion. Probably if there was a view where I could see the eagle from behind or like a "bonnet / hood" view like in racing games, I may have been able to play. Without a point of reference for my body I am totally sick in these type of VR experiences. Good luck with it though as the scenery was nice in my brief fly! Ok got that! Sorry to hear that. You're not the first I had a few people feel ill when I presented it st Fairford! Great feedback though. I'm sure a third person view is possible. There is already a 'hood' view in the observer mode, so that wouldn't be too hard to move over to the game. Just received the CV1 through the post, and as I'd hoped my sim worked straight away. Really missing the B set of lenses though. I didn't need to wear my glasses for dk2, but I have to for CV1 and it's extremely uncomfortable. My frames aren't even that big! Very disappointed... Any advice welcomed. The image is amazing with my glasses, but my frames get pushed on to my face.